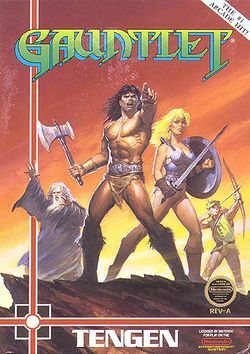 The NES version of Gauntlet is a significant departure from the arcade original, keeping only the basic game formula and cast of enemies. 100 entirely new levels were constructed for this version, and the quest was given a definite goal: to retrieve a Magic Orb located in the 100th level, which could only be accessed by collecting portions of a password hidden in clue rooms scattered throughout the first 99 levels. The game includes all the items and enemies of the original and adds some of its own to the mix. A password system was also added, allowing the game to be saved. This is one of only three Tengen titles to be released as officially-licensed Nintendo cartridges (the others being Pac-Man and RBI Baseball). The game later returned to the arcades as a title for Nintendo's PlayChoice-10 hardware. An unlicensed version was later released following Tengen's split from Nintendo; this version was functionally identical but sported a black cartridge (instead of the grey used by licensed games) and came in a gold-trimmed box. The black clouds swirled over the heads of the chosen ones. Four has come this far, but only two would continue. The portal to their deadly challenge awaited. Foreboding screams rose up from the Gauntlet. Morak the Evil One cackled in glee as he watched the intrepid warriors prepare to enter his most terrible Gauntlet. He knew they would never reach their goal. The Sacred Orb would remain forever imprisoned at the lowest level of the Gauntlet. Without the Sacred Orb, Morak knew the mortals that inhabited Rendar would be helpless against his evil magic. Morak had plundered the lands and hidden his booty in the Gauntlet. He garrisoned his henchmen in the Gauntlet to guard it. There were ghosts, grunts, demons, sorcerers, and even incarnations of death itself. But could the Sacred Orb be in the Gauntlet? No mortal knew for sure. If nothing else, the warriors could retrieve the treasures of Rendar that Morak had plundered and stored in the Gauntlet. If only all four warriors could all continue, on this, the last leg of their quest. Alas, the portal only allowed passage of two mortals. The warriors need your help. Choose from among them the two that shall continue: Become Thor the warrior, Thyra the valkyrie, Merlin the wizard or Questor the elf. The fate of Rendar is in your hands. This page was last edited on 21 June 2014, at 04:59. This page has been accessed 24,635 times.